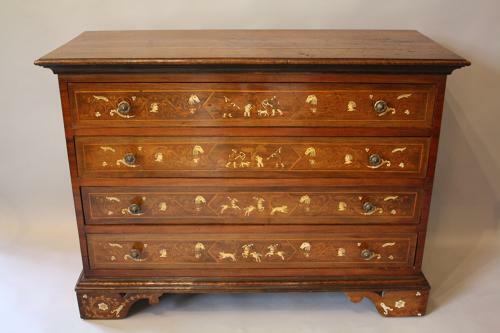 Early Italian C19th bone and marquetry inlaid walnut chest of drawers. Elaborately decorated drawer front panels depicting charming hunting scenes of people on horseback or with bow and arrow, chasing wild boar, as well as other decorative inlay of mythical/ dragon serpent like creatures. Even the side panels and feet of this piece are beautifully inlaid. It most probably originates from the Turin area of Italy. Wonderful patina to wood. Fully restored with later handles.